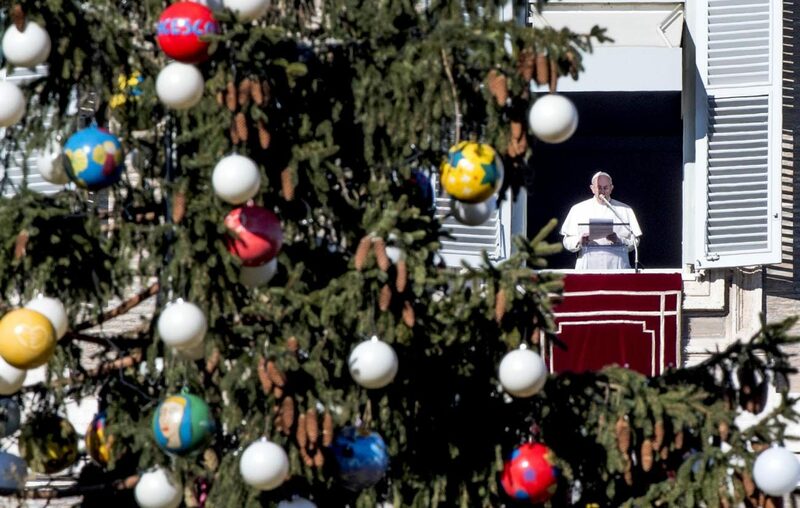 VATICAN CITY (CNS) — Make time to get ready for what Christmas really is about — the child born in Bethlehem signaling that “God is with us,” Pope Francis said. “This week let’s make sure we try to find some time to stop, be quiet and imagine Our Lady and St. Joseph who are going to Bethlehem,” he said after greeting people gathered in St. Peter’s Square Dec. 18 for the Sunday Angelus. God asks everyone if he can “enter our life and offer us his son as gift. And us, what do we do? Do we welcome him, let him draw near or do we refuse him? Chase him away?” the pope said. By welcoming God and seeking to follow him every day we, too, can “cooperate in his plan of salvation for us and the world,” he said. The pope also reflected on the experience of the Holy Family in a Dec. 17 video message to participants of a benefit concert at the Vatican for a children’s hospital in Bangui, Central African Republic, and victims of the earthquakes that struck central Italy. Poverty and mercy, he said, were the way with which God chose to reveal himself to humanity. “Christmas, which is almost upon us, reminds us of the way in which God entered the world: born of the Virgin Mary and, like all children, he was wrapped in swaddling clothes, picked up and nursed. Not only that, he, his mother and Joseph had to come to terms with the fact that there was no room for them in the inn,” he said. God, Pope Francis added, chose to manifest himself not only in precarious circumstances but also first revealed the birth of his son to the most excluded.